Normandy - where it rains just like Oregon! We started off our morning still in Bordeaux. We found a cute patisserie not far from our hotel and had a fantastic pastries and coffee for a little over 5 Euros! We were feeling a little smug about our abilities to find quality places without guide books. We hopped on the autoroute and didn’t get off for hours and hours. Unfortunately, you can really rack up the toll charges driving on the French autoroutes. Our tolls for the day neared 50 Euros! Yikes! For a quick lunch, we stopped at one of the stops on the route. 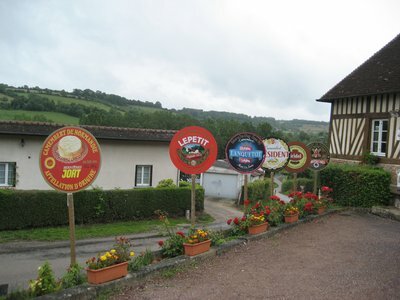 The autoroute stops are like a mini-village complete with gas, restaurant, mini-market, picnic areas, and WCs. The one we found was extraordinarily packed with people. It was rather exciting in a way! We bought baguette sandwiches and I got more coffee from the line of coffee machines. It’s funny how the coffee machines advertised XL coffee and it was still only around 8 oz. I miss my 16 oz mochas! We drove through lots of soggy weather and found our little cottage in Normandy up a windy narrow road. We stopped at another Carrefour grocery store in a town nearby for kitchen supplies. It was nice to stock up on milk, yogurt, cereal, (WINE!) and other staples. We liked the space in our little cottage with its two separate bedrooms – one at each end. At last we had space AWAY from the kids! Have I mentioned just how hard it is at times being together ALLLLLLLLL the time? 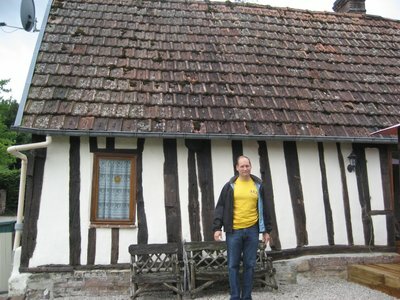 The half-timbered buildings are fascinating. 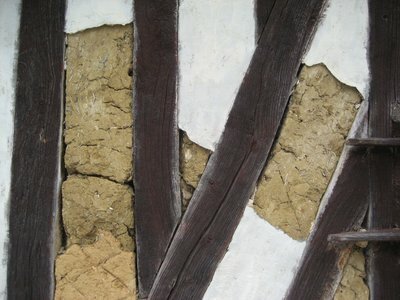 A barn connected to our gite has deteriorated a bit and you can see how clay/dirt fills in-between the wood. 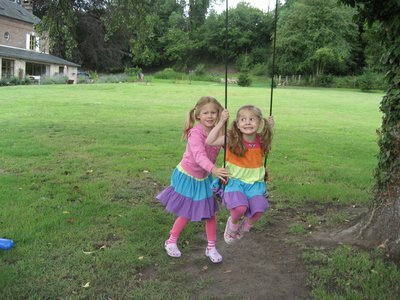 The girls went a little nuts upon arrival in the huge yard and tree swing. The satellite TV had all British (ENGLISH!) channels. I nearly wept! Friends reruns were never more entertaining. We had an easy dinner of pasta and I bought plenty of stinky cheese to try. 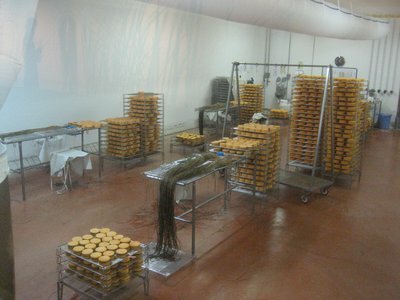 We’re mere minutes from Camembert, Livarot, and many other famous stinky cheeses. The owners of this lovely gite left us a great welcome package with local cider (some for the kids and some for us), calvados, camembert, butter, eggs, bread, butter cookies, and more. They are very friendly and have given us a lot of help. We were supposed to have internet access all week. Sadly, we haven’t been able to access it. I’m typing this update in Word now before I forget. Despite seeing a mouse in our gite – eeeeeeeek! We still slept well and enjoyed having more space. We awoke late and were still getting our bearings in Normandy. The kids enjoyed the swings and massive lawn just outside. 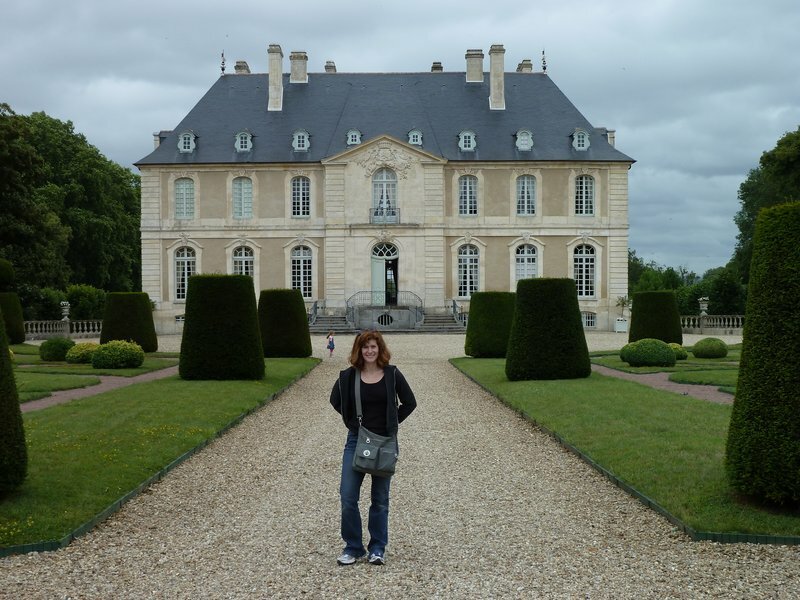 After a leisurely breakfast, we managed to leave and visit a nearby chateau. 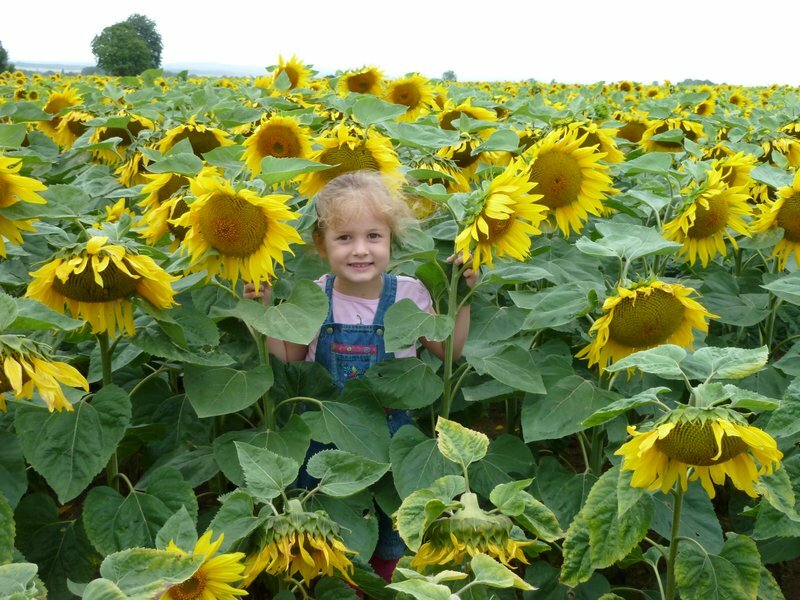 On the way we found a pretty sunflower field and stopped for a photo-op. 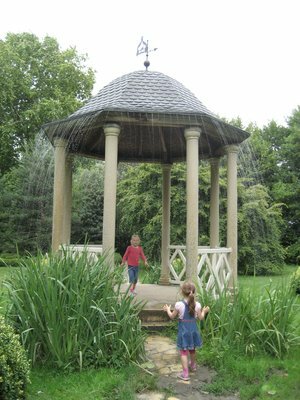 This particular chateau was known for being kid-friendly. 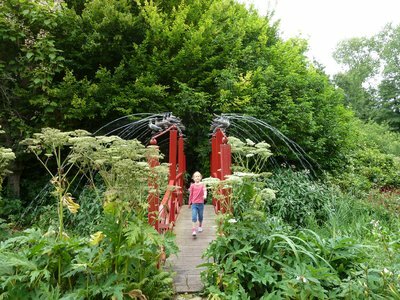 The outdoor gardens had several surprise water features that came on with sensors. There were also some mazes the kids really enjoyed. The indoor area had a lot of miniature antique furniture that none of us got that excited about. 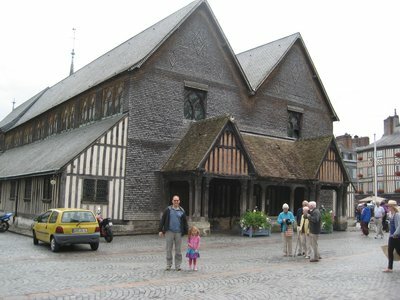 There are a lot of miniature museums in France. I’m not quite sure what the big deal is. It was Sunday in Normandy and pretty much everything was shut down. We went to a nearby town and tried to have lunch. Every place was closed. Many places close between 12-2 for lunch. Restaurants stop serving right at 2. All the villages looked pretty desolate. The pouring rain didn’t help matters. 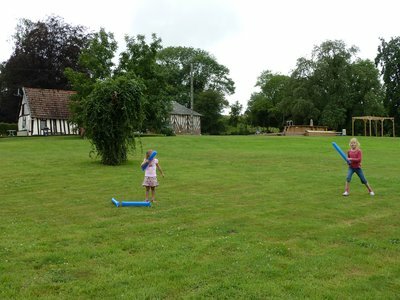 The kids were starting to melt before our eyes so we called it a day and headed back for lunch at our cottage/gite. We didn’t make it far this day. I got a little stir-crazy and borrowed a bike for a short ride on the country roads. The roads around here are like a spider web and go every which way. I felt so silly and panicked for getting somewhat lost! I can barely speak a work of French and didn’t even know how to pronounce the name of the place we were staying. Luckily, I took a few deep breaths and tried another little road that lead me back. That cured me of getting away on my own without GPS for a while! Have I mentioned how fantastically awesome the GPS is in our car? Man. Worth every penny. DH grilled some sausages for dinner along with my concoction for Mac & Cheese – didn’t go over that well. We just hung out and watched it rain while driving each other a little crazy. I think we were all feeling a little homesick this evening. Luckily, DH and I were able to end our day watching the women’s World Cup soccer game against Japan. So sad to watch the US go down. They were the stronger team! 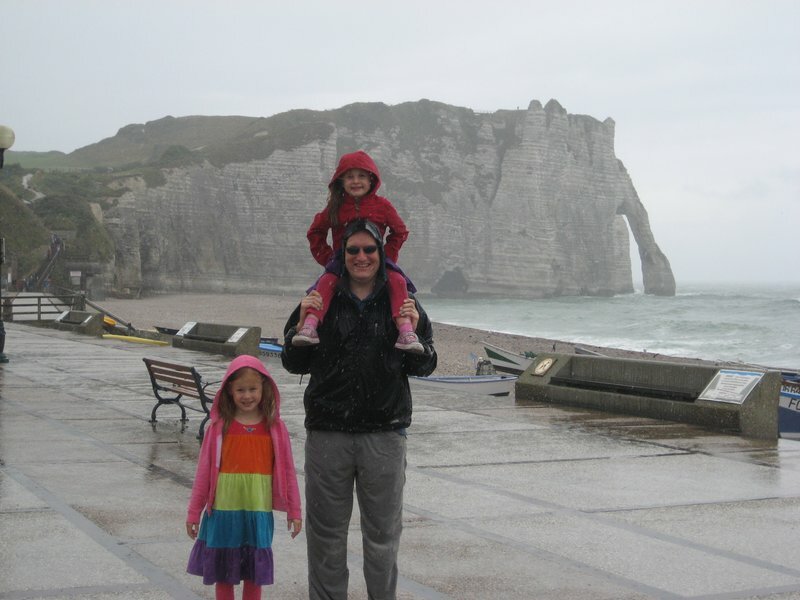 July 18th - Honfluer and Etretat - in the rain! We had ambitious plans for our day after spending so much time at our gite yesterday. 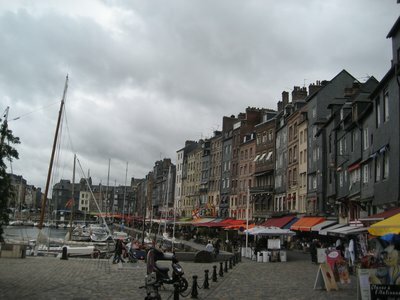 After breakfast, we headed out to the coastal town of Honfluer. It was over an hour away and the rain wasn’t letting up. Being Oregonians, a little rain wasn’t about to change our plans! Honfluer was beautiful. 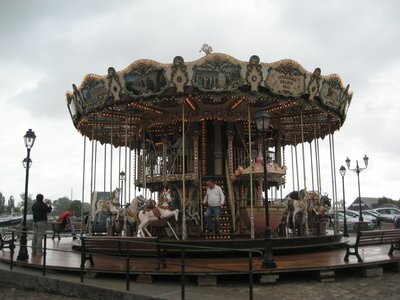 We bribed the kids with a carousel ride so that was the first order of business. Pretty neat that it had two levels! DD#1 was starving again. She can make it about an hour before she’s about to die of starvation. After drying off for a few minutes in the tourist information center, we found a recommended café for lunch. I had some mussels while DH had pizza and the kids shared a savory crepe. 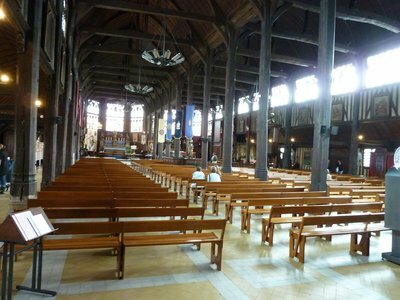 We checked out a church across the way that was made of wood – very unusual. A bomb went through the roof during WWII but didn’t explode. It’s fascinating running into reminders from WWII. Normandy is full of history. 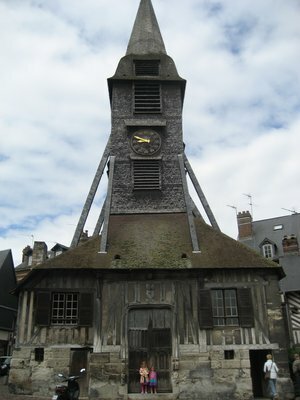 The bell tower was built separately across the way from the church. I loved wandering around the town of Honfluer. DH and the kids found a park along the jetty and I took off to explore and take a few pictures. I didn’t buy any souvenirs – too touristy – but got some nice shots. Even though it was still raining, we took a 45 minute drive to see the famous chalky-white cliffs along the ocean in Etretat. This turned out to be a ridiculous and pretty hilarious side-trip. We were completely soaked. We snapped a few token pictures and I thanked my dear family for putting up with my often ambitious itinerary. We drove back home and stopped at the Carrefour grocery store once again for dinner supplies. The girls were drinking an amazing amount of milk. We had ham tortellini for dinner. 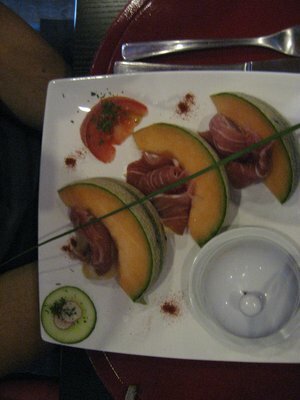 The French seem to put ham (jambon) in about everything. Both DDs behavior was leaving much to be desired. They played outside in the large yard while we cracked open another bottle of vino and called it a day. 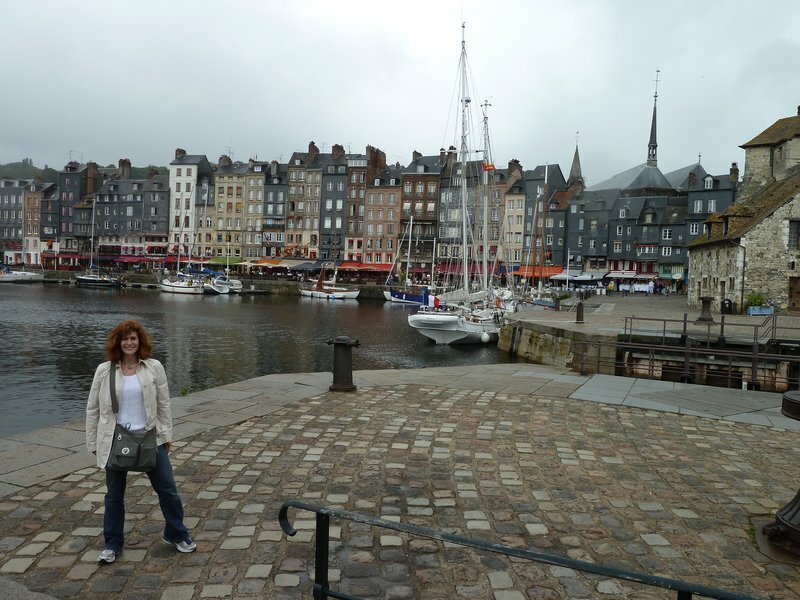 Random thoughts – Normandy is WAY bigger than I expected! Driving to all my planned destinations is much further than I anticipated. The kids were also showing major signs of travel distress. DD#2 was especially throwing some impressive tantrums. We’re one month into our trip and have realized that it’s just plain hard sometimes. I knew it would be but it’s even more difficult than I expected. 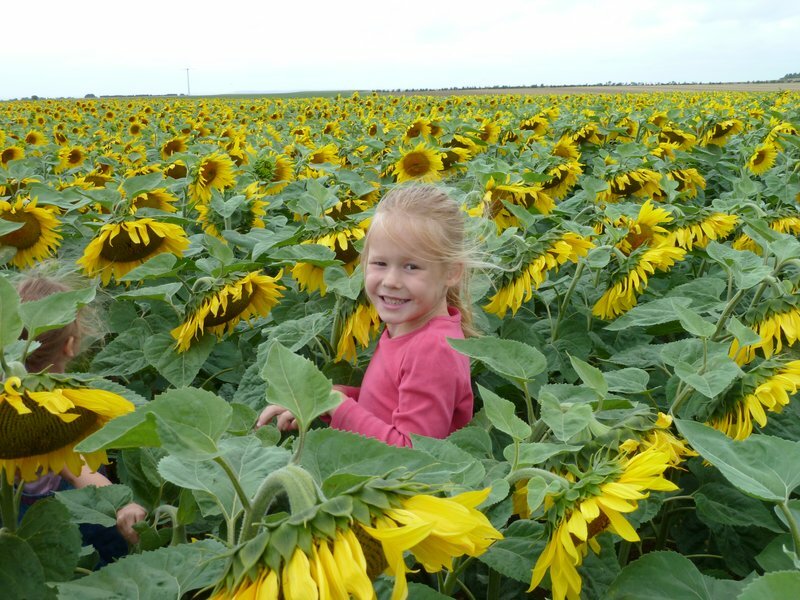 July 19th – Sunshine in Normandy? Could it be? Time for Velorail! We awoke (albeit 9am) to a lovely day. DD#2 had a screaming fit in the night and kept us all awake for a while. 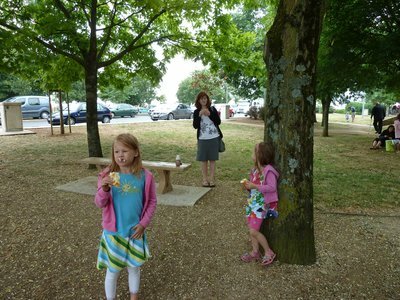 After breakfast, we eventually headed out to a natural park area known as Suisse Normande. The main attraction was the Velorail. 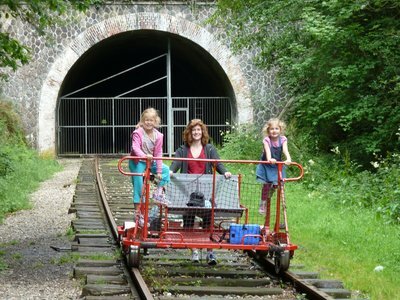 A disused railroad line was now used for tourists. 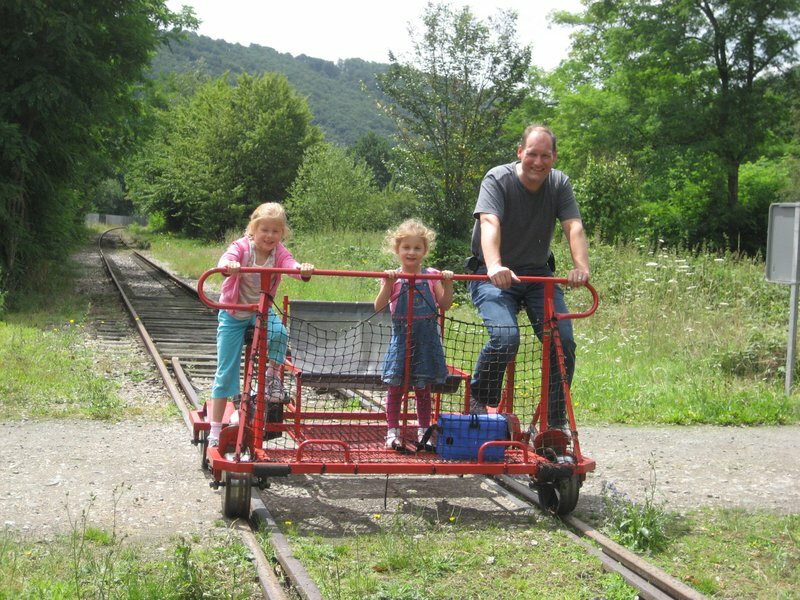 The neatest multi-person "bike/cars" could be pedaled down the tracks. It was another hour drive to get to the attraction. The girls are SO done with long car drives. Geesh! 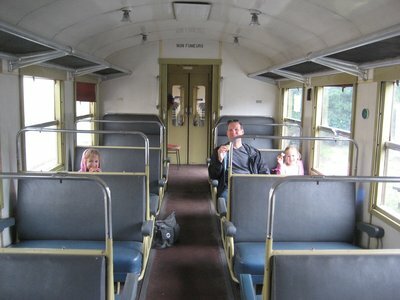 We had an interesting picnic in an old rail car. We all enjoyed the Velorail and it renewed my faith that we can all have fun together. It’s possible! It was a pretty neat experience and a bit of a work-out. We came home and finally took advantage of the nice heated pool just outside our gite. DD#1 and I stayed out for quite a while playing random pool games. DD#2 took a much-needed nap. For dinner, we treated ourselves to a fancy-ish French meal in the nearby town. We actually had courses like they do in France! 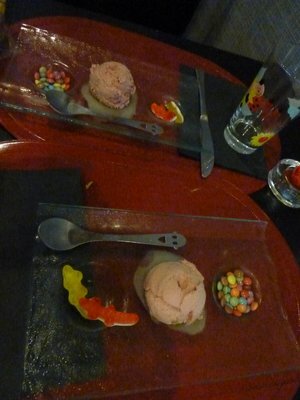 The kids were most excited for their dessert course with ice-cream and candy. We enjoyed walking around the small village after our nice dinner. 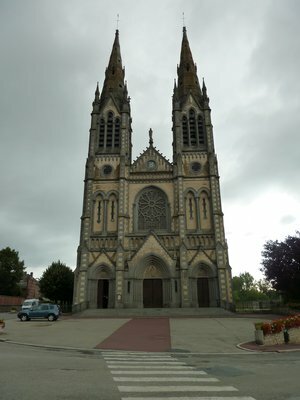 The small town near our gite even has a massive church that probably doesn't make any guide book. It was open after dinner so we did a little exploration. We were the only ones inside. July 20 - Cheese and Rain. That's about it. We woke late feeling tired and a bit homesick. 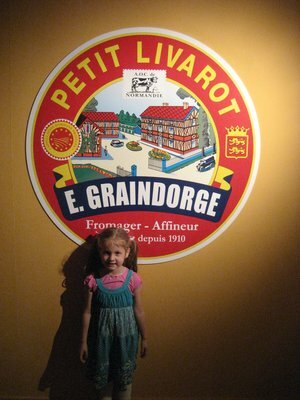 After a very long breakfast and lazy time, we got ourselves to the Livarot Cheese Museum. It was pretty interesting and there were free samples at the end. The robotic production was mesmorizing to watch. The gift shop wasn't bad either. All the cheese labels are really artistic. We came home after much indecision. The kids played outside in yet MORE rain. I took off in the car to the nearby town to do a little grocery shopping and wandering around. 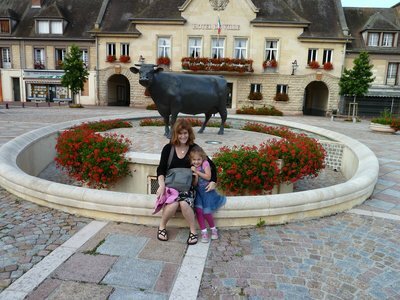 I meandered to the tiny town of Camembert - home of the infamous cheese. Even though the temp probably didn't break 60 degrees today, we swam in the pool mostly to tire out the kids. It was rather refreshing! Luckily it is a heated pool. We had frozen pizza for dinner. Not so bad - seriously! I found microwave popcorn, turned on a movie, and called in a night. Did I mention that DH got our internet going? What a relief to be back in touch! Tomorrow the big plan is to hit Bayeax and the WWII beaches. It will be a big day. An hour and a half in the car! Wish us luck! Also, thanks for sharing about the Velorail. I haven't heard of it and we will definitely be trying to find one now!